"Children should be seen and not heard," goes the old adage. When it comes to their rooms, you can take it one step further: They shouldn't even be seen. Shelter magazines rarely go near them. Just like a lot of parents would prefer not to go near them, never knowing the state of disarray they might find. 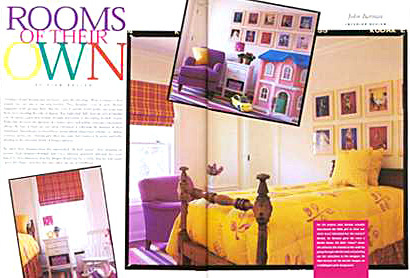 Still, there are a lot of families who do spend a good deal of time, thought and money in decorating the kids' rooms. While they are never the signature of a home's decor and seldom even rate a decorator's efforts, the best of them are very often whimsical in reflecting the fantasies of their inhabitants. Interestingly, we found boys' rooms almost always have a theme, i.e., sailing, cowboys, sports, etc., whereas girls often just want their rooms to be pretty and frilly, alluding to the universal dream of being a princess. We asked three designers how they approached "the kids' rooms" when designing an interior. Each designer obviously had a very different approach, although they were united in their objectives: that the designs should last for a while, that the kids could "grow into them," and that they also reflect the joy of childhood.